North American Legends: Johnny Appleseed – Under the influence! In North American folklore apples are strongly associated with the legendary Johnny Appleseed who is affectionately remembered for his wandering lifestyle planting apple tree nurseries across the great American frontier. His real name was John Chapman and he was born in Leominster, Massachusetts on September 26, 1774. His father, Nathanial Chapman, had served as a soldier in the Revolutionary War. Sadly, he lost his mother to tuberculosis during that war. When he was old enough to work he became apprenticed as an orchardist to a local orchard where he learnt the trade that made that him a legend in his own lifetime. Folklore paints a picture of him dressed in rags with a tin pot on his head striding across the land with a pocketful of apple seeds. These he planted on his way, for all to enjoy out of his sheer generosity. In fact the planting of orchards, or more accurately apple tree nurseries, was his business and he grew apples trees as a business enterprise. His plan was to plant nurseries along the frontier where ever he thought settlers would build new communities. When his trees were between one and two years old he would sell them to the settlers for six cents each. He travelled and planted apple tree nurseries in many places along the Ohio Valley with bases in Western Pennsylvania and in Ohio, in Richland County. One of the folk stories about Johnny Appleseed tells how during the War of 1812 many Indians took the British side looking to avenge themselves against the settlers who they believed had done injury to them. Although they attacked many settlements they did not threaten or interfere with Johnny Appleseed. However, he would often warn the settlements of imminent Indian attacks. A legend tells of how he made a desperate run of 26 miles through the wilderness from Mansfield, Ohio to Mount Vernon in a bid to bring help to the beleaguered settlers besieged by Indians. It is said that as he ran he blew a horn to warn other settlers of the danger along the way. Thanks to his desperate run and courage the settlers at Mansfield were reinforced and saved. Chapman followed the teachings of Emanuel Swedenborg and was a member of the Church of New Jerusalem, which was based on Christian teachings and followed Pacifist principles and advocated individualism and simple living. As he travelled he would spread the message of his church to those he visited and would tell stories to the children in exchange for a meal and a place to sleep on the floor of the house. 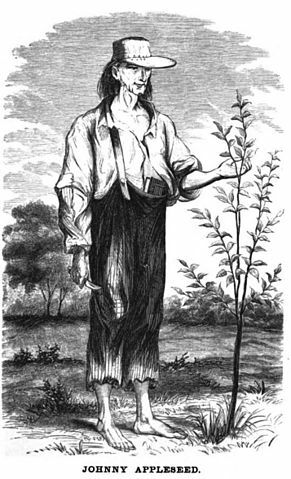 Despite his rather rough and rustic appearance and his eccentricities Johnny Appleseed was a gentle and kind man with great intelligence and charisma and a heart of gold. Indeed, he was also a rarity for his time as he was a vegetarian; not wishing animals should suffer for him. His kindness and concern for animals was legendary. One story is told of how he extinguished his campfire when he saw mosquitoes flying to their deaths into it. He believed that none of God’s creatures, no matter how small, should have to suffer to alleviate his discomfort. Another story tells of the time he set up camp in one end of a hollow log and built a fire for warmth. On discovering the log was already inhabited by a bear with her cubs, rather than disturb them, he moved his camp to the other end, sleeping unsheltered in the snow. Folktales tell how he would buy a horse that was about to be put down and purchase some grassland for the animal to recuperate on. When the horse had recovered he would give the horse to a poor settler on the sole condition that it was to be treated properly and with kindness. One can well imagine how this rather wild, raggedy man, may appear as a larger than life figure to the settlers along the frontier as he came and went about his business growing apple nurseries. He may have been regarded as eccentric but he was well received and seen as a welcome relief by the isolated settlers bringing news and helping out where he could. On 18th of March, 1845, John Chapman died of pneumonia and was buried near Fort Wayne, Indiana, entering into American folklore. This entry was posted in North American Mythology and tagged apples, folk, hero, Johnny Appleseed, legend, lore, North Amercian Legends, North American Mythology, seed, stories, tales. Bookmark the permalink. Thanks for a nice article on one of my favorite frontier heroes! Just one quick correction: it’s Emanuel Swedenborg, not Edward Swedenborg. I haven’t heard this story in a very long time!! Thanks for bring up a blast from the past! !